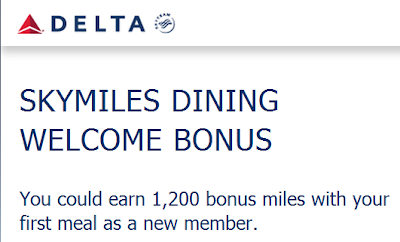 If you have recently joined Delta's frequent flyer program, as I have for 50,000 free Delta frequent flyer miles, see my post here. 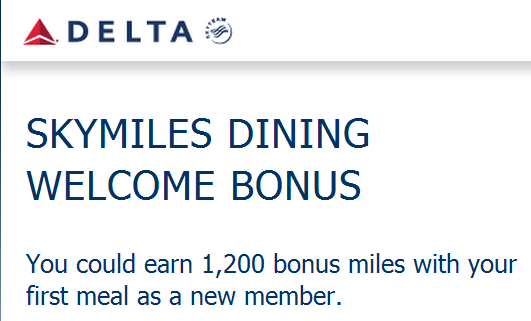 If you sign up for Delta's Skymiles Dining as a new Delta member, not only will you receive 5 miles per dollar you spend at over 10,000 restaurants, you will also receive 1,200 bonus miles. 1- Sign up for Skymiles Dining. 2- Spend $25 at one of the participating restaurants within 30 days. 3- Within 30 days, you will receive an email to review the restaurant. Complete this review.